The aromatic blend of spices match well with the sweetness of the strawberries. Combine first 7 ingredients in a plastic bag, and mix well to coat chicken. Place thighs, nuts and any extra spice mix on a non-stick oven tray and bake for 25 mins. 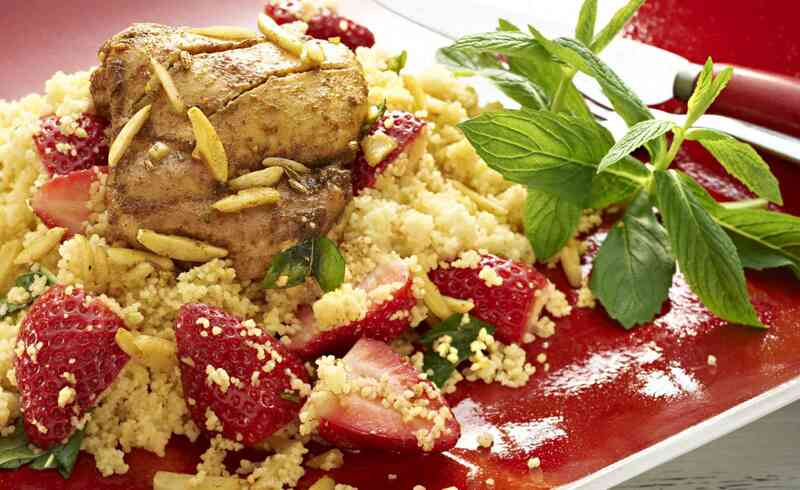 Remove from oven, keep chicken warm, then add cous cous, stock and strawberries to the tray, cover tightly with foil and place back into oven. Allow to absorb for 5 minutes. Remove foil and stir cous cous, place chicken back on top of cous cous and bake a further 5 – 10 mins. Remove from the oven, serve chicken, then toss mint through cous cous. Serve with natural yogurt if desired.